We wish to thank everyone for their support as we move towards a new and modern stadium at Casement Park. The Ulster GAA is now preparing a new planning application for the redevelopment of the site and it is hoped a fresh application will proceed after an extensive consultation which will assess the views of stakeholders in the vicinity, across West Belfast and from further afield. Your input will be welcomed as part of this process. We value your opinion and wish to make it as easy as possible for you to respond at the right stage so your views can be heard. Our planned calendar of activity will progress in three phases. Each phase aims to ensure stakeholders and members of the public are kept informed as the project progresses. – Phase 1: Scope of the Environmental Impact Assessment: Phase 1 will encompass the technical Scoping of the Environmental Impact Assessment (EIA) which aims to engage with statutory and non-statutory bodies along with relevant stakeholders to determine the content and extent of the Environmental Impact Assessment. An EIA of the proposed redevelopment will identify key topics for assessment as well as other reports and information with an Environmental Statement being submitted to Belfast City Council in support of the proposals and to assist in the determination of the application. – Phase 3: Final Submission: Following an extensive consultation and after assessing the views of all stakeholders we hope to submit a fresh planning application. Members of the public will have the opportunity to make formal representations on the final submission to the Planning Authority at this stage. The aim of Environmental Impact Assessment is to protect the environment by ensuring that a local planning authority when deciding whether to grant planning permission for a project does so in the full knowledge of the likely effects and takes this into account during the decision making process. Ulster GAA is keen to canvass the technical and professional views of Belfast City Council and other statutory stakeholders on the contents of the Environmental Impact Assessment. The local planning authority must consult statutory consultees before providing a scoping opinion. Once the Council receives a response from the statutory consultees and has had the opportunity to consider them, it will issue its Scoping Opinion. The Council should provide its opinion within six weeks (or longer period if agreed in writing with applicant) of receiving a request. Once the Council’s Scoping Opinion is provided Ulster GAA will begin preparing its Environmental Statement. Ulster GAA will seek input and opinions from members of the public, statutory consultees and other stakeholders as part of this process. It is envisaged that the key areas on which views will be sought are Transport, Socio-Economic Impacts and Design. Once Belfast City Council have provided their scoping opinion we will begin a 20 week consultation programme. In weeks 1-3 a calendar of activity will commence to help raise awareness of the forthcoming consultation to help ensure everyone who wishes to take part is aware of when and how best to respond. In addition to a series of events our planned calendar of activity will help ensure stakeholders and interested parties are kept up to date via leaflets, online via our website and social media. Feedback will also be accrued via surveys and questionnaires. We will publicise information on how comments and queries can be received via a range of mediums including through the website, e-mail, post, at public events and from un-manned displays. Our aim during the consultation period is to obtain feedback on issues of importance from all stakeholders. To canvass opinion and encourage continued participation in the community consultation the Ulster GAA will host a series of events and workshops throughout the 13 week period. 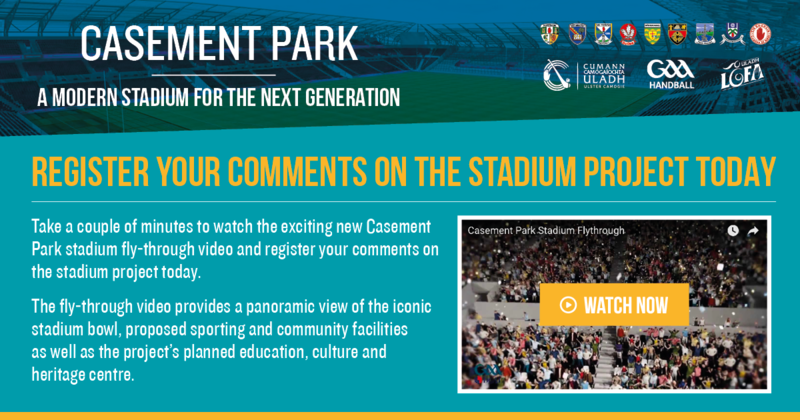 This also gives us the chance to share our vision for the redeveloped Casement Park. The consultation is open to members of the public, community groups and other stakeholders and we welcome feedback on our emerging proposals. 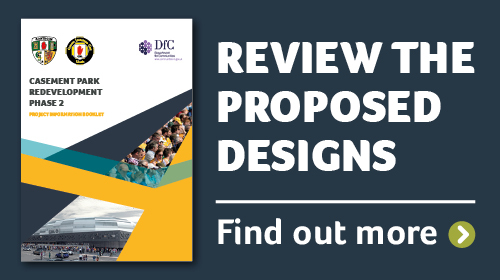 Once all responses have been reviewed the GAA will consider the views expressed and will finalise the design of the scheme, the Environmental Statement, Transport Assessment and Socio-Economic Impact Assessment. Throughout this period we aim to furnish stakeholders with all the information they require to make an informed opinion on the project and to help ensure they know how and when to respond to the consultation. If you would like to be keep up to date with the consultation process please add your email address to our mailing list to receive regular updates or follow us on Twitter and Facebook. Following an extensive consultation and after assessing the views of all stakeholders we hope to submit a fresh planning application. At this stage members of the public can make formal representations to the Planning Authority in respect of the final application. To keep up to date with the project please add your email address to our mailing list to receive regular updates or follow us on Twitter and Facebook.